DKC 3 -- Barrel-Blastapalooza is an online Flash game that was hosted on the now defunct Donkey Kong Country official website, as well as in the Nintendo Arcade section of nintendo.com. It was created to promote the Game Boy Advance release of Donkey Kong Country 3. 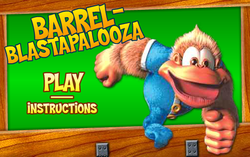 Much like the game it advertises, Barrel-Blastapalooza stars Dixie Kong and Kiddy Kong. The game features a single level and its objective is guiding Dixie and Kiddy throughout a short maze while collecting all DK Coins on the path. Navigation is done by Barrel Cannons, which must be placed along the way. Players have a supply of ten Barrel Cannons which can be dragged and placed throughout the maze, although not outside it nor on its walls. The player can rotate a placed Barrel Cannon to change the direction of its launch using a small cursor next to it; however, the Barrel Cannon that initiates the launch is fixed. Once the player decides their Barrel Cannon set up is ready, they can press the "FIRE!" button and blast the Kongs through the maze. A TNT Barrel is displayed on the down-right corner of the screen, with a long, burning fuse serving as a timer. As the barrel approaches its explosion, it starts flashing red; if the fuse burns out completely, the Kongs will be forced to start navigating the maze regardless of the set up. Should the Kongs bump into a wall, the player will lose and be led to a screen allowing them to restart the game. If the Kongs are launched into a barrel they have already been through, they will simply pass by it. If the Kongs reach the finish and collect all DK Coins without any events, the game is won and will redirect the player to a screen which congratulates them. Both the win and game over screen feature a render of Dixie Kong climbing a rope, next to a link to the official Donkey Kong Country site. This page was last edited on June 24, 2018, at 03:18.